Lake St. Clair is a large freshwater lake that lies between Ontario, Canada and the state of Michigan, USA. It is a part of the Great Lakes system and fed by two rivers, St. Clair River and the Detroit River. It connects Lake Huron with Lake Erie. It has a total surface area of 430 square miles (1,100 km2) and average depth of just 11 ft (3.4 m). Both the USA and Canada maintains a deep shipping channel for nautical transport. Fishing is phenomenal is Lake St Clair, with the most sought after species being walleye and yellow perch. 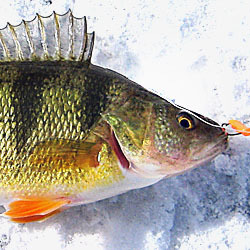 The lake is a factory for perch and walleye due to the abundance of forage and the often stained water, which is preferred by these fish species. Perch and walleye are most often caught trolling worm harnesses and or jigging in the deep channels. Lures of choice include, rattle spoons, rattling raps and just plain twister tails. In Winter, ice fishing is very popular on Lake St. Clair as the lake becomes dotted with ice huts and anglers on ATVs and snowmobiles. Minnows jigged off bottom or still fished catches the majority of the perch and walleye, although rattle spoons and raps are also very effective. Lake St Clair is famous for it's trophy muskie fishery. Each year in late fall anglers from all over North America travel to Lake St. Clair in hopes of catching a trophy muskie. They are usually rewarded as this lake is full of big muskie. Due to the plentiful baitfish, as well as high densities of perch, walleye, sunfish, bass and pike, the muskie have a a very good forage base. Each year Muskie in excess of 30 lbs are regularly caught, although the average muskie is 10-15 lbs. Both trolling and casting large muskie lures, like cowgirls, shadzillas, spinnerbaits and large crankbaits are very effective at enticing these toothy critters into striking. Bass fishing is also popular on Lake St. Clair. Both smallmouth bass and largemouth bass are very abundant in the lake. 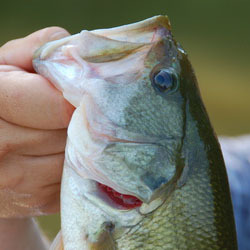 Largemouth bass are usually caught along weedlines and in shallow back bays, canals and marinas. Smallmouth bass are literally everywhere in lake, many sharing the same habit as largemouth bass, although the deeper channels are most productive, especially in mid-summer. A large variety of lures most commonly used for bass fishing are all effective, although spinnerbaits, crankbaits and flipping jigs make up some of the more popular presentations. Lake St. Clair is a world renown fishery, if you ever get the chance to visit it, drop a line, you won't be disappointed. Each detailed map provides depth, contours, structure, boat ramps, and updated fishing information. 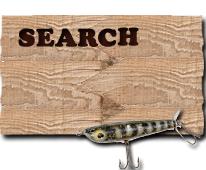 Lake St Clair fishing maps also include lake info such as gamefish abundance, forage base, water clarity, weedline depth, bottom composition, complete latitude/longitude grid lines and dozens of GPS waypoints & coordinates.